A minimal performance for 1 person. A non-serious exploration of a sincere and re-occuring situation most people can relate to. The title is taken from a typographic work I made in 2008. The performance seeks to express a situation based on visualising and interpreting this typographic piece by using body movements and other non verbal expressions. I had planned the performance since a long time - finally it was recorded in Summer 2010 in Liverpool. To actually do the performance was a very intense physical experience and was necessary as the actual performing unfolded different, additional and unforeseeable aspects and possibilities of expressions. As a result I edited the material into 5 parts: 'Intro - Outro', 'Result - Output', 'Attempt', 'Part One', 'Part Two' and 'Part Three'. I decided that the 5 parts could be shown as loops simultaneously. The differing length of the loops leads to continuously changing combinations of video scenes and soundscapes. The arrangement of loops creates a more open narrative showing aspects at the same time. In this way it is possible to either grasp an overview over the elements or get immersed into it as long as wanted. 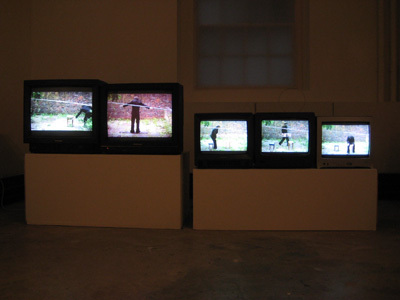 As a result the audience can enter or leave the installation at any time.